A Life of Sugar and Spice: Rudi's Tortillas Review and a GIVEAWAY!! Winner Announced!! Random number generator = 5 jacobithegreat you win!!!! Send me an email - jen at a life of sugar and spice dot com, with your mailing information so I can get this prize pack sent to you by Rudi's!! Recently the folks at Rudi's were kind enough to send me some samples of their three new tortilla flavors, plain, fiesta and spinach. I have been looking forward to trying these since I first saw them on Marlow's blog a while ago. 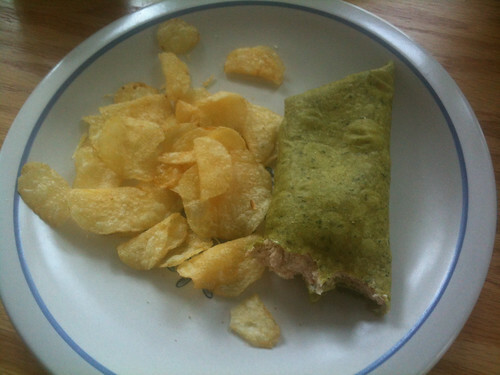 Here I'm having a spinach tortilla filled with tuna salad. These wraps are SO good. Pop them in the microwave for 20 seconds and you have a soft, pliable wrap that does NOT fall apart in your hands. I happened to have some leftover taco chicken from dinner so I filled a fiesta wrap up with some of that topped with guacamole and dairy free sour cream. So delicious. Very little leakage and it did not fall apart at all. I'm in love!!! I had to freeze them but just pull one out of the freezer, pop it in the microwave for 30 seconds - perfect. I'm sorry I don't have better pictures for you but unfortunately, last wednesday I threw my back out. Making lunch at all was a chore and messing around with my camera was out of the question. That crappy iphone pic was all I could do! Thankfully I'm feeling much better, not 100%, but better every day. Now, to the giveaway! 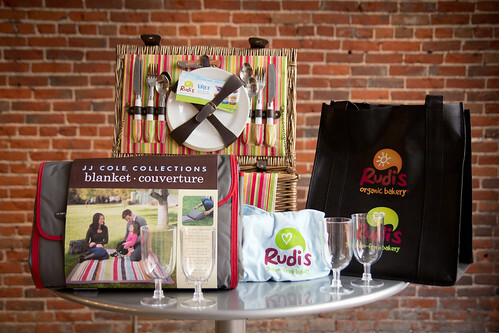 Rudi's is giving away a picnic basket full of goodies! All you have to do to win is leave a comment below! The winner will be chosen by random number generator on Saturday 8/25. Also - check out the What's Under Wraps? Giveaways on Facebook that are going on for the rest of the month of August!! Can't wait to try the spinach wraps! Yum, I would love to try these! Looks like a good work lunch! Nice! I've heard of these too, but haven't been able to find them in stores! These tortillas look awesome, but I haven't been able to find them anywhere yet. I'll keep looking! That looks delicious! I will have to look for these. What a fabulous giveaway! Haven't found the tortillas here yet. Can't wait to try them! Eleanor here from Rudi's Gluten-Free Bakery! Great lunch idea:) I hope you all enjoy the contest! Head over to our FB page for the last two days of our "What's Under Wraps" Giveaway!